Mea culpa - I've been meaning to post this but have been swamped with teaching. So with just 15 hours left to enter, let me clue you in to kind of a neat promotion: Win a backstage pass to "Meet the Press" a week before the election. Normally, I don't shill for these things, but this one's being put on by Omaze, a startup that's raising money for causes by offering "experiences" like this. The beneficiary of the "Meet the Press" gig is the Young Storytellers Foundation. You and a friend get flown roundtrip to Washington D.C. and put up in a hotel. 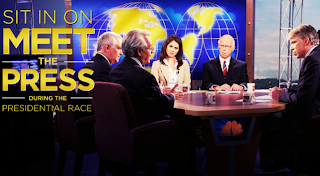 VIP access for you and your friend to "Meet the Press." Sit on stage in one of 10 seats usually reserved for friends and family. Taping takes place Oct. 28, a week before the election. As with all these things, caveat emptor. But I think it's at least worth checking out.